26 • RV PRO • November 2018 rv-pro.com O P E N H O U S E C O V E R A G E Coachmen Mirada 35OS The Coachmen Mirada is priced as a mid-level Class A gas motorhome, but has the appeal of a high-end Class A gas motorhome because of all the residential appliances and fea- tures it has this year. The Mirada 35OS (opposing slides) took center stage at Forest River's Expo, following a compelling unveiling at the Hershey show where it was the No. 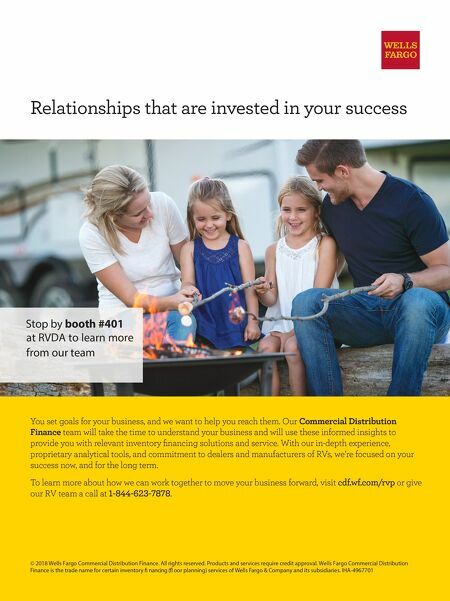 1-selling Mirada floorplan, according to Zach Eppers, national sales manager for Coachmen Class A gas products. It's "the first Mirada with opposing slides and one of the most spacious Miradas we've ever built with almost two full- wall slides," he says. The 35OS offers a full-wall slide-out on the passenger side and a large slide on the driver's side. "On the interior of the Mirada, we have worked exten- sively with our suppliers and interior designers to create a newer modern look that will appeal to more customers," Eppers says. Inside features include Beauflor laminated flooring, Wil- liamsburg furniture, theater seating, tri-fold Visionary sofa, a big dinette, a 50-inch TV, a large pantry, a king-size bed, large residential LG refrigerator and microwave, solid-surface coun- tertops, full glass subway tile backsplash, flush floor, an exterior entertainment center, a 20-foot awning and fiberglass roof. "It has almost a diesel motorhome feel to it," Eppers says. The Mirada is prepped for a stackable washer-dryer. A power drop-down bunk at the front of the coach is available as an option. Many RVers – especially the younger generation – will appre- ciate the WiFiRanger extender, which allows users to connect to Wi-Fi up to a mile away, depending upon clearance. It also allows RVers to boost their hot spot for their cell phones and other devices and it allows the RVer to install a SIM card without connection. The solar prep will allow dry campers longer periods of camping time, Eppers adds, even with residential appliances. The Wi-Fi and solar prep advances, added to a more contem- porary look, will allow Mirada to continue to grow, according to Eppers. The 35OS has a GVWR of 22,000 pounds. The MSRPs start around $140,000. What impressed RV PRO: Coachmen touts that the Mirada interior "feels less like a vehicle and more like a home" – and it's true. The opposing slides really open up the coach, and the residential-style features provide that homey atmo- sphere. Coachmen also seems to have hit a good price point with the Mirada. 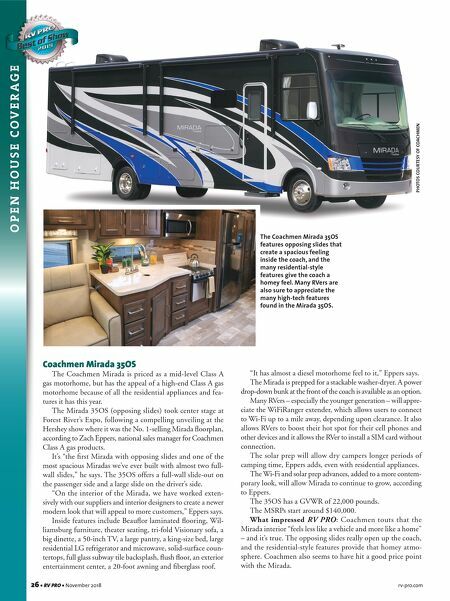 PHOTOS COURTESY OF COACHMEN The Coachmen Mirada 35OS features opposing slides that create a spacious feeling inside the coach, and the many residential-style features give the coach a homey feel. Many RVers are also sure to appreciate the many high-tech features found in the Mirada 35OS.